Earth is a big place. And over the past several millennia, humans have filled it with big, magnificent things, such as massive pyramids, giant walls, sprawling cities, and much more. But to the International Space Station (ISS), which is hurtling through space about 250 miles above the surface of Earth, our big planet can look kind of small. Houses, roads, and buildings all disappear. Even some of our biggest constructions can get swallowed up in the swirls of blue, white, and green that characterise our planet. 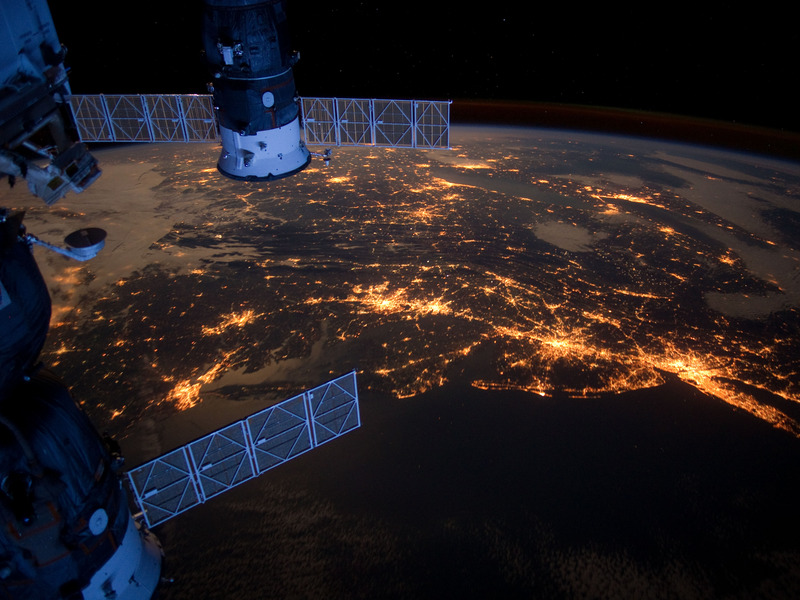 But, there are some structures that, even 250 miles away, are visible from ISS. Do you see a pair of small triangular shadows at the center of this photo? Those shadows, and the small speck right below them, are actually some of the most mind-blowing constructions ever built by humans. They are three of the most well-known ancient Egyptian pyramids: the Pyramids of Giza. 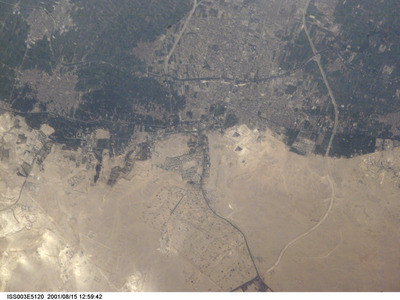 The largest of the three is nearly 500 feet tall, but from space it just looks like a tiny smudge in the Egyptian desert. At night, light pollution from cities drowns out stars in the sky. 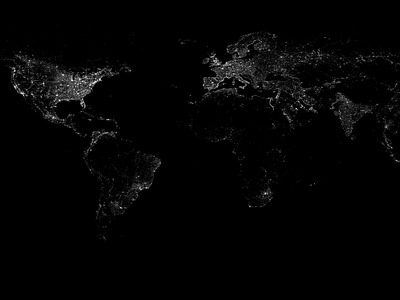 But if you look down on a few of these cities from space, the artificial lights create a constellation of their own, illuminating the area all around them. 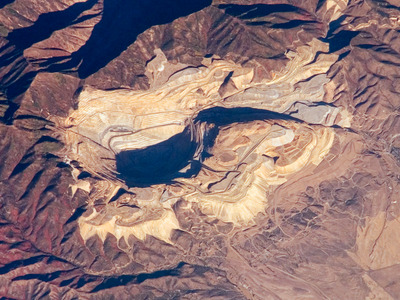 The Kennecott Copper Mine, southwest of Salt Lake City, Utah, is one of the largest open-pit mines in the world. It measures about 2.5 miles across and it is about 4,000 feet deep. Mining first began there in the late nineteenth century to remove gold, silver, and lead deposits. Humans have been building bridges for a long time, and we've only been getting better at it. We've progressed from creating small bridges of logs and stones to constructing massive, carefully-engineered steel and concrete structures that are designed to support millions of vehicles every year. These giant bridges stretch across thousands of feet of water to connect land. 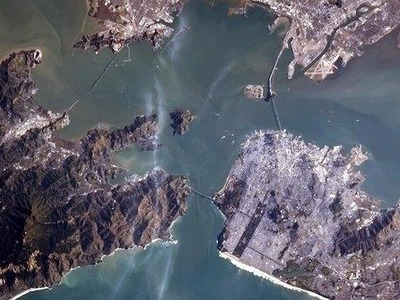 This picture of bridges was taken by astronaut Christ Hadfield as the ISS orbited above the Bay Area. 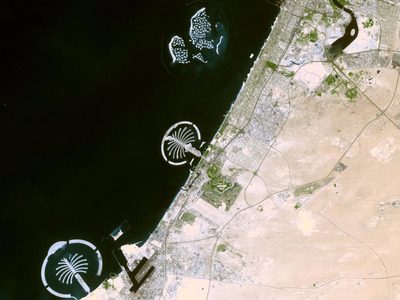 The Palm Islands are a collection of human-made islands along the coast of Dubai. To build these islands, workers dredge sand from the bottom of the Persian Gulf, and then spray the sand to create shapes that stand out in the dark water. Some of the islands are constructed to resemble palm trees. The island at the top of this photo is still under construction and it is created to take the shape of a world map. 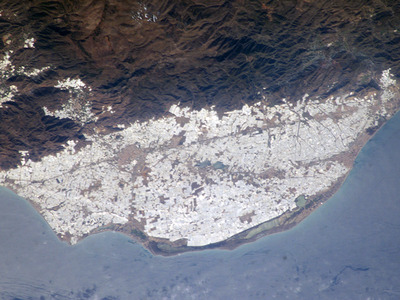 In the Almería Province of southeastern Spain, there is a vast sea of greenhouses that can be seen from space. They cover more than 64,000 acres of land. Millions of tons of fruits and vegetables are grown in these greenhouses to be exported to other parts of the world.